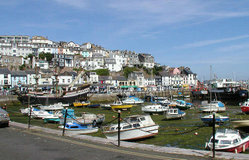 Devon is a large county in South West England, bordering on Cornwall to the west, Dorset and Somerset to the east. The name Devonshire was once common but is now rarely used, although it does feature in some names and titles (such as the Duke of Devonshire), and is still to be seen on signposts in the county. Devon was one of the first areas of England settled following the end of the last ice age. Dartmoor is thought to have been settled by Mesolithic hunter-gatherer peoples from about 6000 BC. The name "Devon" derives from the name given by the Romans to the Celtic people who inhabited the south western peninsula of Britain at the time of the Roman invasion c. 50AD , known as the Dumnonii, thought to mean 'Deep Valley Dwellers'. The Romans held the area under Military Occupation for approx 25 years. Later the area became a frontier between Brythonic Dumnonia and Saxon Wessex, and some historians claim that this resulted in the effective conquest of Devon by Wessex by 715 and its formal annexation around 805. However, this is a matter of controversy. Later William of Malmesbury claimed "that the Britons and Saxons inhabited Exeter aequo jure" ("as equals") in 927. Devon has also featured in most of the civil conflicts in England since the Norman conquest, including the War of the Roses and Perkin Warbeck's rising in 1497, the Prayer Book Rebellion of 1549 and the English Civil War. Perhaps most notably, the arrival of William of Orange to launch the Glorious Revolution of 1688, took place at Torquay. Like its neighbouring county to the west, Cornwall, Devon is relatively disadvantaged economically compared to other parts of southern England, due to the decline of many traditional industries such as fishing, mining and farming. Consequently, most of Devon has qualified for the European Community Objective 2 status. The epidemic of Foot and Mouth (Hoof and Mouth) disease in 2001 harmed much of the farming community severely and had knock-on effects on the rest of the county. The attractive lifestyle of the area is drawing in many new industries which are not heavily dependent upon geographical location; Dartmoor, for instance, has recently seen a significant rise in the percentage of its inhabitants involved in the financial services sector. 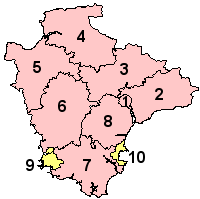 Devon is one of the rural counties, with the advantages and problems characteristic of these. Devon has its own (unofficial) flag which has been dedicated to Saint Petroc, a local saint with numerous dedications throughout Devon and neighbouring counties. The flag was adopted in 2003 after a competition run by BBC Devon. The winning design was created by website contributor Ryan Sealey, and won 49% of the votes cast. However the creation of the flag has caused some controversy. The cross design is reminscent of both England's St George's Cross and neighbouring Cornwall's Saint Piran's Flag (which also uses black and white). The colours of the flag are those popularly identified with Devon, e.g. - the colours of the Rugby Union team, and the Green and White flag flown by the first Viscount Exmouth at the Bombardment of Algiers (now on view at the Teign Valley Museum). The Dartmoor National Park lies wholly in Devon, and the Exmoor National Park lies in both Devon and Somerset. In addition Devon is the only county in England to have two completely separate coastlines. 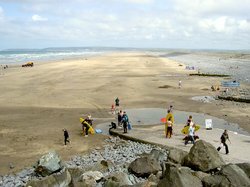 Both the North and South coasts offer dramatic views: much of both coastlines is named as Heritage Coast, and the South West Coast Path runs along the entire length of the both. The inland of the county has attractive rolling rural scenery and villages with thatched Cob cottages. All these features make Devon a popular holiday destination for many Britons. The variety of scenery and habitats means that there is an exceptional range of wildlife. A popular challenge among birders is to find over 100 species in the county in a day. 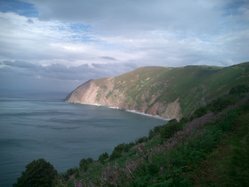 The landscape of the south coast consists of rolling hills dotted with small towns, such as Dartmouth, Salcombe, Totnes etc. 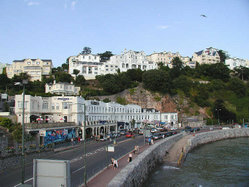 The towns of Torquay and Paignton are the principal seaside resorts on the south coast. 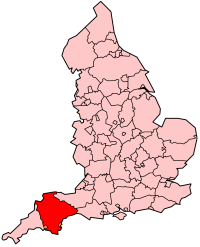 The north of the county is very rural with few major towns except Barnstaple, Great Torrington, Bideford and Ilfracombe. This is a list of the main towns and cities in Devon.